Similar to 4-year institutions, community colleges are struggling to find ways to increase the success rates of racial and ethnic minority students in general and Black males specifically. According to data from the Beginning Postsecondary Students Longitudinal Study (BPS), compared to their male counterparts, Black males have the lowest retention and graduation rates among their peers. 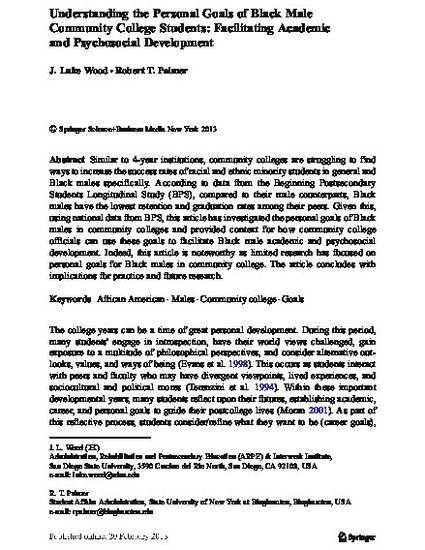 Given this, using national data from BPS, this article has investigated the personal goals of Black males in community colleges and provided context for how community college officials can use these goals to facilitate Black male academic and psychosocial development. Indeed, this article is noteworthy as limited research has focused on personal goals for Black males in community college. The article concludes with implications for practice and future research.